Today I hosted the 40th and final broadcast of my Hay House Radio show. It’s been an amazing experience and part of me wanted to stay and do four hundred shows, but it’s time for me to take the next step on my journey. 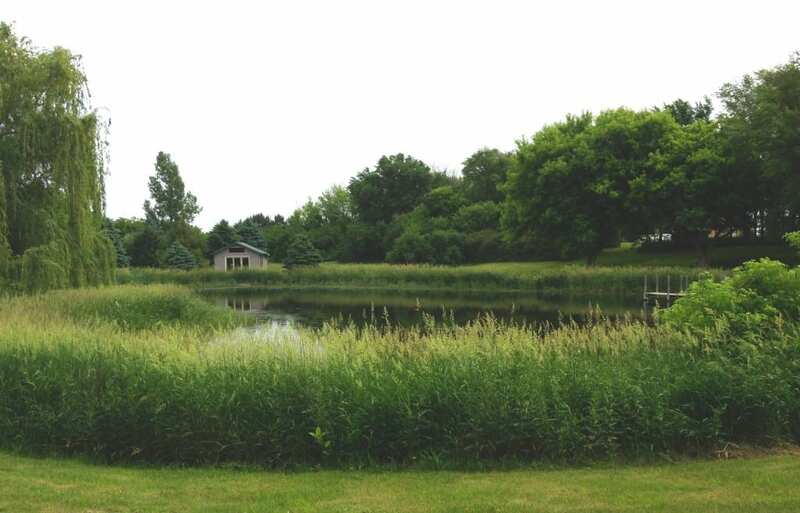 I’ve spent the last weeks sitting on the dock at my best friend’s pond in Iowa. I was surrounded by beauty in the form of thousands of little frogs, a few toads, birds, a muskrat family and one of the most beautiful weeping willows I’ve ever seen. Sitting in nature gave me an opportunity to get really quiet, the kind of quiet I rarely encounter in Los Angeles, and I started to reflect on and examine my life, my desires, and my mission. I’ve created much of the vision I’d held for this time and there is much to be grateful for, but as the days passed I couldn’t shake a sort of quiet nagging from my center. This nagging has been there for a while, but it’s easy to lose sight of when I’m immersed in my life—and this is a very dangerous thing because when we suppress or ignore our inner promptings we fall out of flow with our higher knowing and often lose precious time taking a longer, harder, detour instead. So instead of consuming myself with life and quieting my inner promptings, I turned all of my focus to the nagging within. I got curious about what it was, what it was telling me and within a few days, I knew what I needed to do. 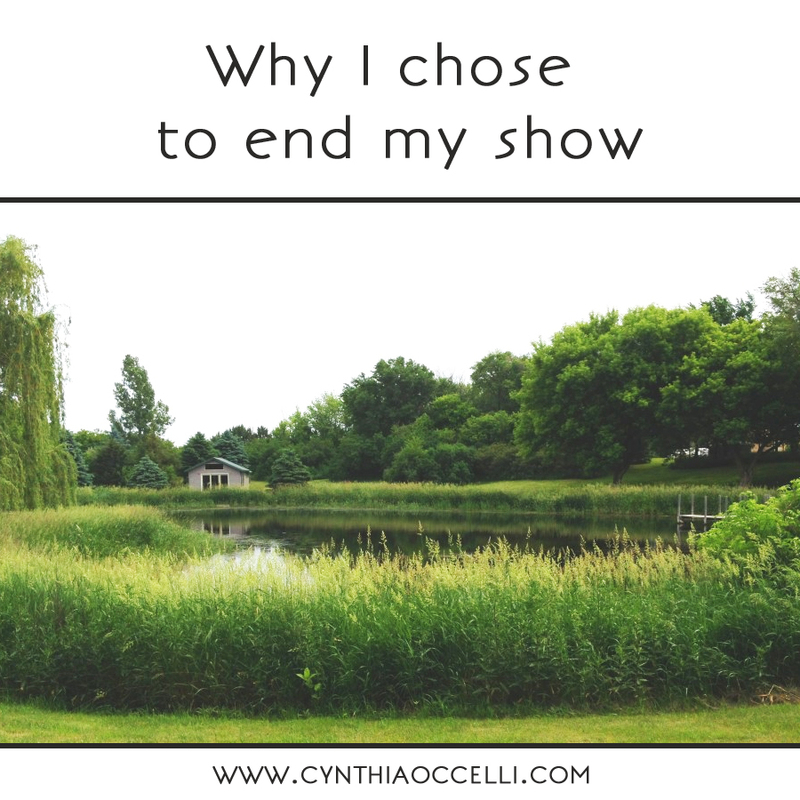 I chose to share my personal experience on today’s the show (full version here), because it presents an opportunity to check inside yourself and see if there’s something nagging, prompting, or urging you to change, or let go–something that you may be resisting. My resistance to change goes back to my love of comfort, predictability, the illusion of control, and ultimately hiding. I know this might not sound like me, but it’s my personality pre-set. It’s what I did when I wasn’t conscious of my purpose or calling. It’s what I did when I didn’t yet understand that life is fluid, always changing, always flowing, and no matter what we do we cannot change it, we must change. The dangerous part is when you cling to an aspect of life that goes against the current of your life. When you cling to what you have and resist the change that is seeking to emerge, life will call on you to let go. If it can’t get you to move with gentle currents, it will send stronger messages, rougher waters, and if you continue to cling to what you must release, it will send a tidal wave. These are the big events, the one’s that break you down to break you through. I’ve had a few of those and I’ve discovered that I much prefer to learn, live, and grow through joy–the gentle waves–than through suffering. So the way this relates to my decision to end the show is that I work really hard on everything I do and the show was no exception; it’s not uncommon for it to effectively take 1-2 days out of my week. I wouldn’t change it either; I don’t give half-efforts anywhere. In addition to the show, I have a full life. I am a mother, I have a business, a relationship, a home, and a plethora of interests that keep me up at night. It’s a challenge to manage it all. Recently, some new opportunities have emerged–opportunities to stretch and grow, to do more public speaking, more video (YouTube), more audio (a new podcast) and even TV. And here’s how I reacted: I can’t do it! Oh I wish I could take these opportunities, this all sounds so wonderful, but my life is just too full right now – I don’t have the time. I am finally comfortable with the radio mic (that took 20+ shows) and nothing is broken so why interfere, right? This is a cop-out that we use to justify stagnation. Everything that matters to us needs our energy or it will break and why must we wait until things break? I am a champion of perseverance so I almost bought it, but I nearly fell off that dock when I heard Seth Godin say (in the one audio book I decided to listen to on my trip, “The Dip”) that this might be the most wrong advice ever. He explained that successful people smartly quit things all the time – they just don’t quit their big idea. A bird in the hand beats two in the bush. Now this one was perfect because how could I give up the beautiful bird I had for just the potential of some other beautiful birds? And the answer arose like a light: because if I do not reach for my potential, I will always look back wishing and wondering what would have happened if I’d had the courage to believe in myself and trust life. And there it was, the crux and essence of this whole experience. If I fully and completely believed in myself and trusted life, I would let go and I would reach outside of my comfort zone. I would rise to new opportunities without hesitation. I wouldn’t settle for comfort, or make excuses for not following my deepest promptings. I wouldn’t stick my head in the sand and wait for a tidal wave to rip me from what it’s time to release. And with that, I messaged the program director, a woman I love, and told her I wanted to end the show. For now, I wish you tremendous peace, joy and success. Finally, before I go I want to leave you with a series of questions to help you get tune into your inner knowing. If you can, answer these questions before bed and ask your inner guide/intuition to show you the answer in a way that you’ll recognize and understand. Remember to surrender all judgment and criticism when your answers come up. –Is there anything nagging at you that you might be trying to ignore, or resist? –Is there something, or someone, that you know you need to release and let go of so that you can move onto becoming your greatest self? –Where in your life would you show up differently if you absolutely believed in yourself and trusted that life was for you, never against you? –How often have you rationalized that you can’t or shouldn’t have, or do things that you want to do? –How long have you lived your life being “good” and earning the right to spend a few hours or days experiencing pleasure, doing what you love, or living on your terms? –Where are you in your life now? –Are you living your greatest expression? –If your life ended today would you be satisfied and fulfilled? –What do you ache for? –What do you really want? I am grateful to you for walking this journey with me. Stay close. Lin, this is wonderful! Bless you. I Listened to your last show yesterday on hayhouse radio. What a superbe message! Your shows were always inspiring and empowering…I will miss you, though I think you really live the talk which is admirable! Mariana – Thank you so much for listening and writing. I’ll be launching a new, shorter, on-demand podcast very soon. Stay tuned 🙂 Love to you. Cynthia, Be blessed, for you are indeed a blessing! What a great and timely article! This describes my current situation so well. Good luck with your future projects! Same to you Dawn, I know it will be wonderful for both of us. Always love catching up and relating to where you are at. Look forward to what the future holds! Cynthia, thank you so much for your presence. I loved the way you articulated yourself so gently but powerfully, and at the same time, was able to relate your situation to ours. Truly magical. Would I be able to have a full transcript of your last show? I would greatly appreciate it! Hi Karla, I don’t have a completed transcript, I know I said I would, but I went way off of my show plan. I’ll post a permanent link to the show. I love this, Cynthia. But I am wondering…what do you do if u are truly an introvert…not shy, or reserved, but truly an introvert who just processes differently, and needs to be allowed to do so? Hi Deborah – I am that 🙂 I have to set boundaries and be clear in my communication with the people around me. I’ve explained to all that I need lots of space and sometimes I get over-stimulated and need quiet and to be alone. When those moments come, I tell them what I need. I also live somewhat counter-culture in the sense that go out when people are in (meaning LA traffic), avoid crowds, etc. Create a list of what you need to feel good and be productive and then build it into your life. Doing this has made me able to thrive in a big family with lots of activities and pets. Does this help? Love to you. Hi Cynthia… I just listened yo your last show and it was a fitting date as it was my 37th birthday… listening to the show put through a stream of tears and deep sobs because I’ve had the ache you speak of since I was about 24…but in my twenties I pushed it aside and felt that “i still had time”.. now im in a new state i moved to last year with my husband, no children, no friends, unemployed and family that live far away and the ache is back in full force. I started listening to hay house and started meditating here and there and really feel the need to find my spiritual path and practice it intensely. But the stresses of finding a job and beating the biological clock sometimes takes over and I fall into old thoughts and patterns that dont serve me and my introvertness takes over. I feel like I dont know what my passion is and I dont know what I want to do in life sometimes and its scary and makes me feel like im missing out and have no purpose.. i dont know If i want kids but the talk around me is I need to soon, i dont know if i want to still work in insurance but my head is saying i need a paycheck and thats where i have the most knowledge. I love exploring spirituality, meditation and finding my goddess.. I feel like im part of something special and wish I can live that way 24-7… I know this is not a question but i wanted to express what ran through my mind while listening and thank you for sparking something in me again to keep moving forward and hope one day i will find my way soon and things will finally fall into place..
Hello, LeeAnn, thank you for this special note. It made me smile. Living the life we want takes honesty and bravery. I am so proud of you, and I’m grateful for you.